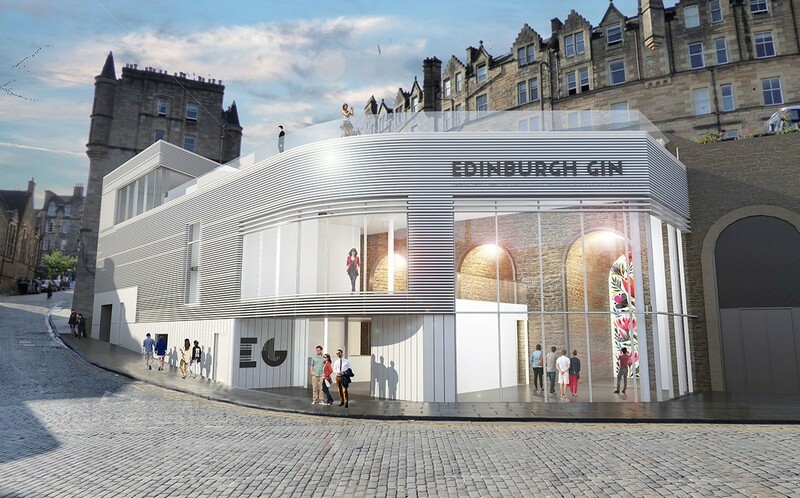 Edinburgh Gin is set for expansion in the city’s Old Town after owners Ian Macleod Distillers showed their hand in plans to repurpose redundant arches on East Market Street for a distillery and visitor centre. As the public face of the brand visitors will be enticed inside through a combination of a learning experience on the history of gin making alongside make your own gin facilities and rooftop terrace tasting rooms. A glass fronted entrance will offer a transparent view of goings on from the street, offering the public a view of the distillation equipment and retained arches. Detailed plans will now be submitted to Edinburgh City Council by Staran Architects with completion expected by 2020. Sorry guys, to be negative, but that's a No from me on every conceivable level. #1 Whats up? It not look like its from Nineteen Canteen, that the issue? Would some fake sandstone & slate make you like it? wonder if zone will get a shot at delivering this one in a role reversal for these arches! #2 - Fair enough. Time will tell, (my personal opinion is really neither here nor there) as this proposal will try and negotiate its way through the bureaucratic grinder and come out the other end,no doubt looking completely different. I look forward to seeing it then. It might even pass muster at a visually banal level, who knows. On another simple level, I don't see any evidence of contextual thinking as a design approach, which some may consider as a pre-requisite, given the genius loci of the site. There is no grain of memory here. History is dis-continued. Even if context is ignored, then this proposal by any measure is really fairly non-descript and something you wouldn't look twice at in an out of town retail park. 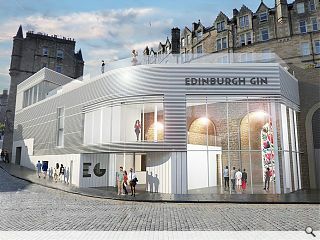 If the rationale for the architectural approach taken is that the proposal reflects the industrial 'shiny' technology of the gin brewing process, then even then, it is a poor reflection of the technology involved. Lastly, i daresay is the question, is the proposal architecture? No, would have to be my answer. It's just a building dressed in fairly dull modernist clothing and that's it. What you see is what you get. Is anybody's life, or the built environment enriched by this? Come to think of it, where is Big Chantelle, these days anyway? Big Chantelle disappearance is neither here nor there..... however there are some odd looking concrete supports on the M74. There are some positives here! The glass viewing platform, as it will give a nice walk out view to Carlton Hill. Also the full length glass feature showcasing the original arch is nice. Unfortunately that is where the positives end of me. The rest of the design is completely out of context even considering the modern buildings around it and a better design for this site could be constructed. #6 - not really, just a comment, at the time thought it was a shame that the competition winning architects didn't get a chance to deliver their project on this site and it was handed over to a no doubt cheaper practice. There isn't a site here! ?....without destroying the setting of the arches that is, and this attempt certainly does exactly that. Bold, but actually quite dull, structure in a predominant site for a (currently) fashionable drinks brand. WTF? Just like the dreadfully crass Premier Inn World across the street, the architecture is not worthy of its location, however I fully expect this to get planning.....! This part of Edinburgh is becoming a shambles but this is just taking the piss. Awful. #5 I assumed Big Chantelle had undergone surgery, lost the accent and come back as Fat Bloke on Tour..? Looks like a value engineered proposal for a casino? Who cares though? This part of Edinburgh has been botched so it will probably fit in. Utterly honking. Yes, have a roof terrace. Yes, don't hide the arches that you are building in front of. But no, to absolutely everything else about this design. Sorry if this was a students work. It's not bad if it was free, but don't do it for the love of god. No contextualism. Just incontinence. Crap.